Faitheist | Ego! Ego! Ego! 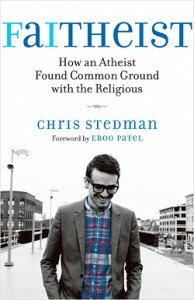 I can’t remember how I first heard about Faitheist, Chris Stedman’s account of how he became a born-again Christian and then, some years later, a complete atheist. It was probably through Teo Bishop, who first mentioned the book on Twitter and then made it the first selection of his new book club. Regardless, I’m glad I did, because holy crap this book is so good. Stedman is currently the assistant Humanist chaplain at Harvard, and he’s an incredibly active force in the interfaith movement. Yep, that’s right: he’s an atheist and he’s big on interfaith. That contradiction is a huge part of what Faitheist is about — how he went through the phases he did and wound up where he is. The underlying question of the book is one that I’ve been struggling with off and on since the 2012 election cycle got started: how does one have a respectful, serious discussion about intensely personal subjects (like religion or politics) with someone whose views are radically different from one’s own? I refuse to believe it’s not possible, in spite of the flame wars and Facebook kerfluffles I’ve seen over the years. Stedman’s story proves that it is possible, and actually necessary for people with deep ideological differences to have these discussions with each other — in part because that’s how we find the ways that we are similar and become able to work together toward peace and other valuable goals. It’s a really inspiring idea, atheists and the religious working together to make the world a better place. If a gay atheist like Stedman can do interfaith with the profoundly religious, surely I can figure out how to talk about important stuff with my deeply conservative relatives. The other thing I loved about this book is Stedman’s honesty. He has gone through problematic phases, said and thought nasty things, and had some awful experiences. He tells these stories with a humility that really impressed me. He doesn’t shy away from the discomfort of sharing them with his readers. I tore through this book, and am actually looking forward to rereading it in a month or two, at a more sedate pace, to really savor what Stedman has to say. He’s pretty young (and even mentions in the book that he feels a little young to be writing a memoir-ish sort of thing), and I can’t wait to see what he does next. I hope we have many years yet to come of this unusual and inspiring man’s work. This entry was posted in Srs Bznss and tagged reading, religion. Bookmark the permalink. Thank you! This is an incredibly well-timed book recommendation. Now having read the book, while it’s an interesting and at many times moving memoir, in terms of concrete techniques for actually following his example, I found it somewhat lacking. He seemed to be clear on what to do (create personal relationships, share stories, listen non-judgmentally), but on how to do it, I’m still kinda stumped.